Mix crumbed biscuits with melted butter and press in grease loose-bottomed cake pan. Bake on 180C for 30 minutes. Reduce heat to 150C and bake for another 30 minutes. When cool chill well in the fridge. Spread with caramel treat or any topping. 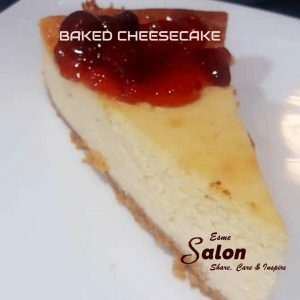 Baked Cheesecakes and others, please help yourself and enjoy! What are tennis biscuits? Probably like digestives I imagine. Sounds yummy. I do love cheesecake! Rachel – yes its a typical SA biscuit but any digestive biscuit will work. This looks lovely and easy to make, Esme.